bestseller list for nearly two years. You can hear countless brainstorming meetings where people refer to purple cows and say things like, Thats not good enough. We need to create a big moo! But how do you create a big mooan insight so astounding that people cant help but remark on it, like digital TV recording (TiVo) or overnight shipping (FedEx), or the worlds best vacuum cleaner (Dyson)? Godin worked with thirty-two of the worlds smartest thinkers to answer this critical question. 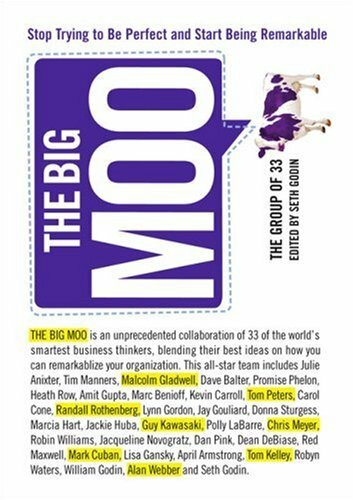 And the teamwith the likes of Tom Peters, Malcolm Gladwell, Guy Kawasaki, Mark Cuban, Robyn Waters, Dave Balter, Red Maxwell, and Randall Rothenberg on board created an incredibly useful book thats fun to read and perfect for groups to share, discuss, and apply. The Big Moo is a simple book in the tradition of Fish and Dont Sweat the Small Stuff. Instead of lecturing you, it tells stories that stick to your ribs and light your fire. It will help you to create a culture that consistently delivers remarkable innovations. Deborah Moggach lives in London.Bestselling business book author, entrepreneur, and speaker Seth Godin was born on July 10, 1960. He graduated from Tufts University in 1982 and earned an MBA in marketing from Stanford Business School. Godin worked as a brand manager for Spinnaker Software and founded his own book packaging business, followed by the online marketing company Yoyodyne. He was a vice president of direct marketing for Yahoo, and in 2006 he launched the popular community website Squidoo.